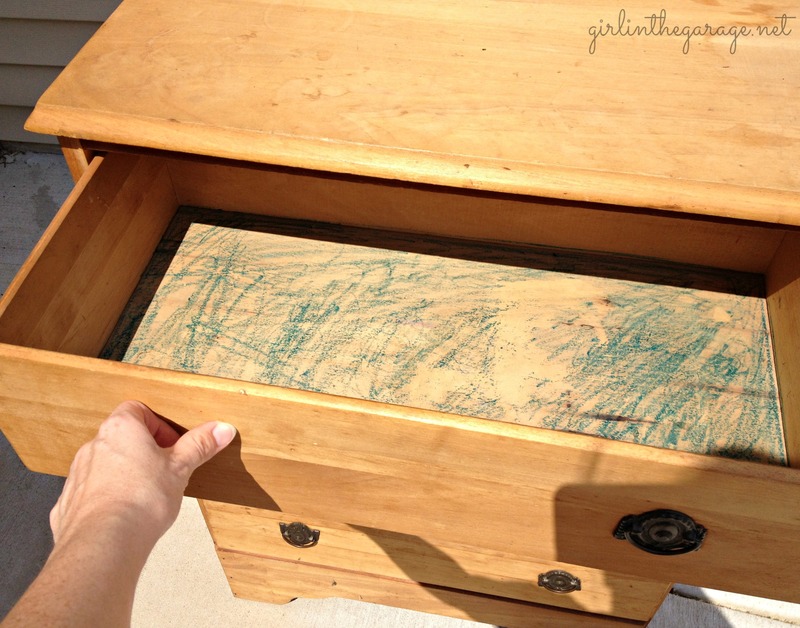 Recently I was lucky enough to find this dresser in a state of unfinished wood and vintage hardware, and even the green crayon didn’t detract from it’s potential. It was pretty much a blank slate! 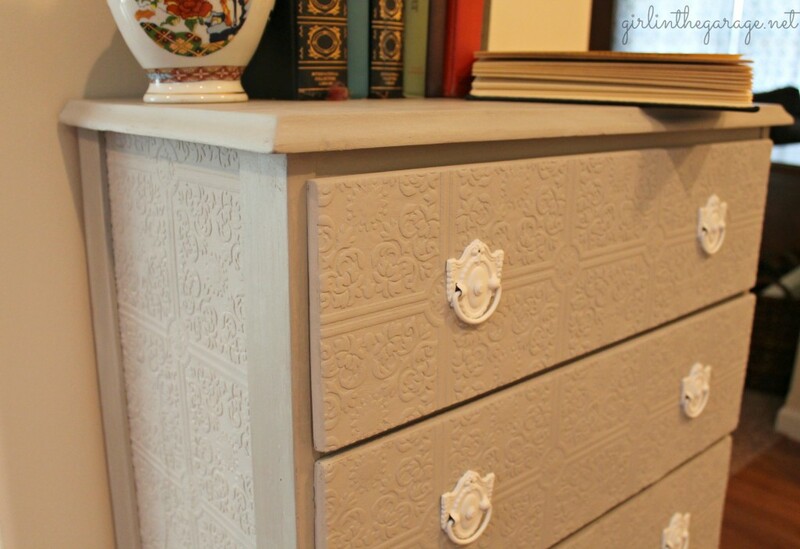 It needed some major beautification so I sanded it and then pulled out my paintable wallpaper that I used last year on the front of this armoire (which is still being used every day in our bedroom, by the way). 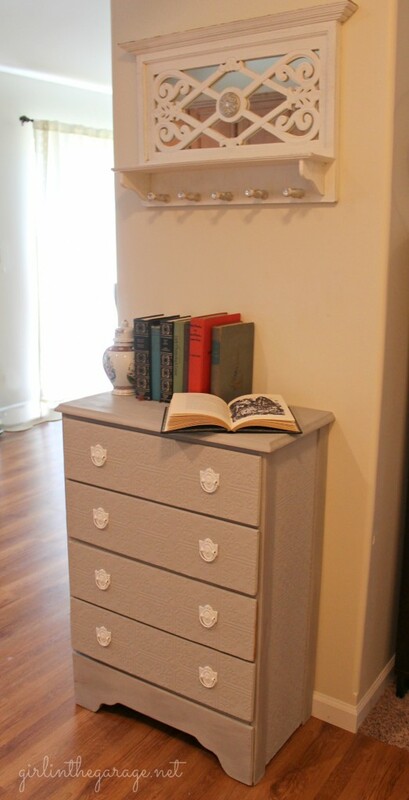 I cut panels for the sides of the dresser and then for the drawer fronts, and carefully used Mod Podge to glue them on. 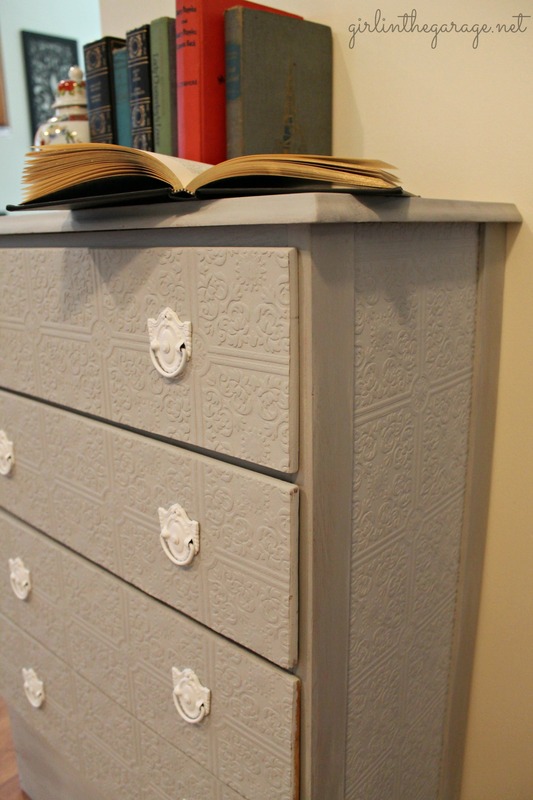 Then I painted it all in Paris Grey Annie Sloan Chalk Paint. Let me just say this- paintable wallpaper is a very cool thing. It can make something boring look fabulous. But it’s also a pain to paint. If it’s very textured (like mine is) you may need to give it several coats to get all the little grooves. I did it first with a big brush and then twice with a little artist’s brush. Finally I gave it a couple coats of Annie Sloan clear wax, and spray painted the handles white. 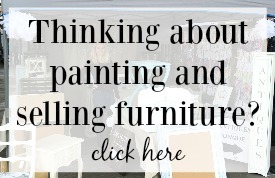 Would you ever wallpaper your furniture? 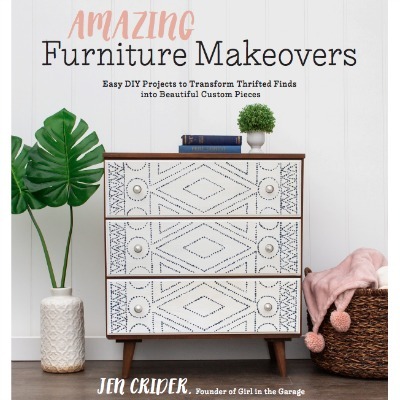 When you join this thriving online community of 90,000 creative souls, you'll be inspired to discover hidden artistic talents and learn skills to boldly face DIY projects with confidence. 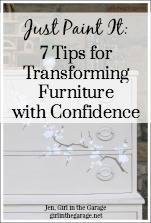 You'll also receive my free guide "Just Paint It: 7 Tips for Transforming Furniture with Confidence." The dresser came out very nice. That’s quite a unique way to do it! New follower look forward to seeing more. Thanks Jamie- glad to have you following along! Great job Jen! It turned out so cute! 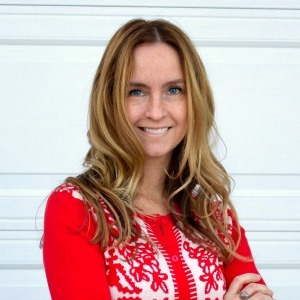 Shanna Gilbert recently posted…Pinterest Party Friday!!! It looks terrific. 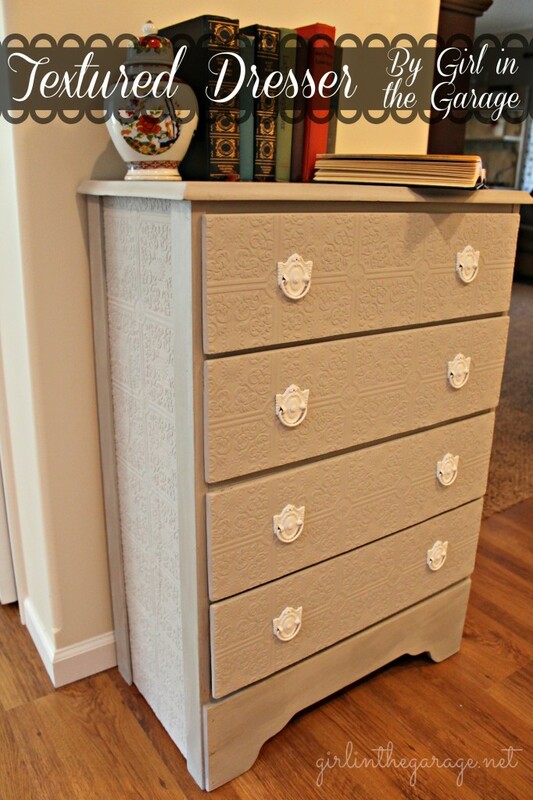 I love upcycled furniture projects. The texture is gorgeous and it looks very classy. I haven’t used paintable wallpaper, but I can think of quite a few uses for it. Rebecca, thank you! 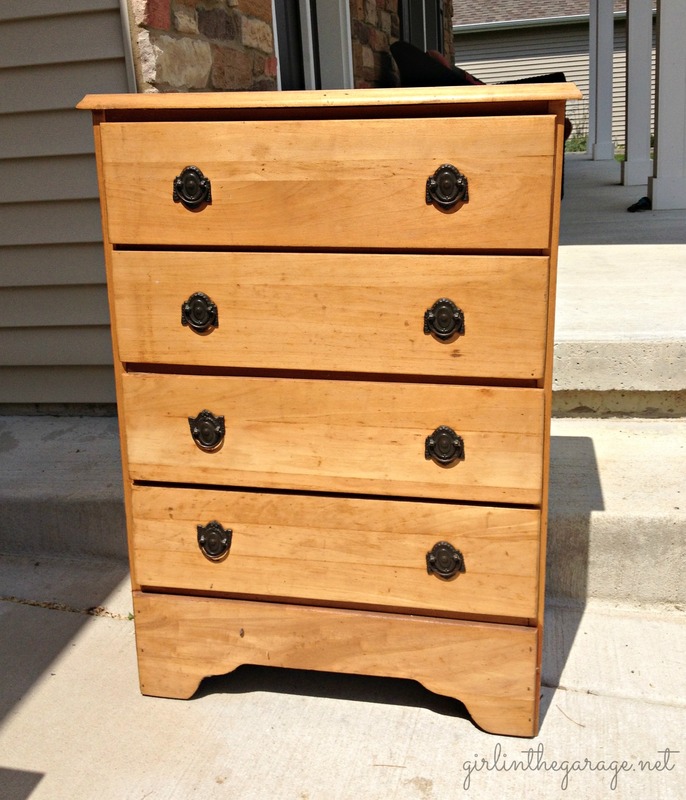 I love upcycled projects too- they’re a great way to bring new life to something old! What a lovely visual effect this makes. Especially with the uniform color. Its gorgeous! This looks great! The wallpaper gives it so much character and I love the white pulls. I have the same paintable paper on the doors of my built-in in my living room. Love it! Clever makeover. The painted wallpaper looks so elegant! I love the transformation! I wish I could find furniture in it’s natural state! And yes, I actually have wallpapered furniture before! 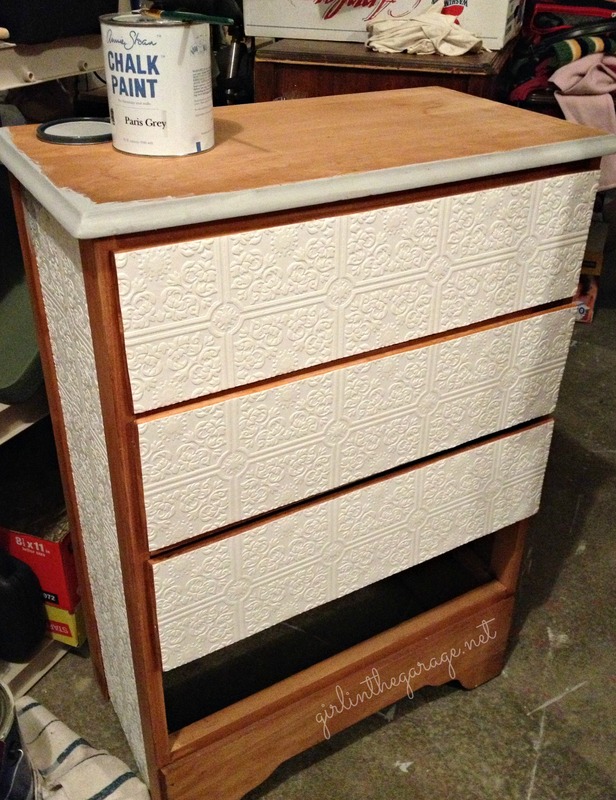 I had a night stand with a severly damaged top and wallpaper did the trick! 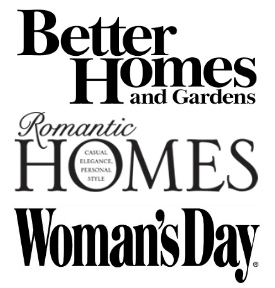 Cassie @ ThePenny-WiseMommy recently posted…How I keep my home clean and safe…while saving money too! Love it!! Thanks for sharing at my Pin Me Party! Love it, Jen! The wallpaper is the perfect touch. And, for the record, it’s always unbearable in Houston!! 😉 Thanks for linking up to Give Me the Goods! This is brilliant! 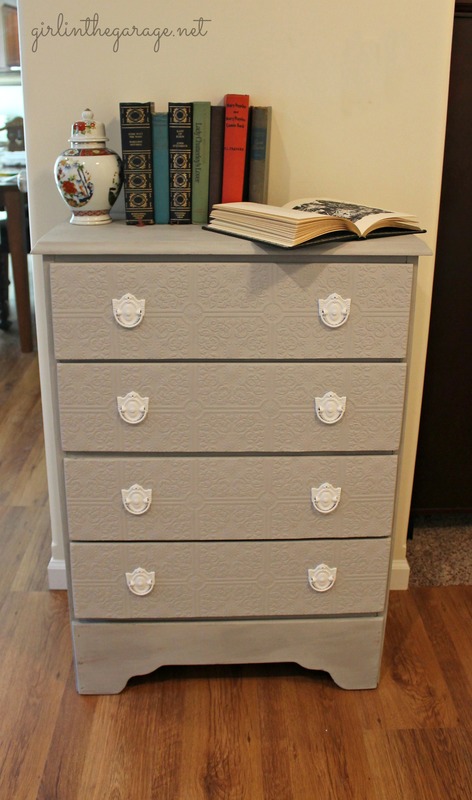 I pinned it for later…I have another dresser I need to redo soon. It looks great! How did you get the ends to not peel up? Thank you Susie! After gluing the panels on, I applied extra Mod Podge around the edges to keep them flat. Then I painted over everything, so they were pretty firmly attached. Thank you! 🙂 I don’t even remember how I got the idea to do paintable wallpaper, maybe on Pinterest a long time ago. Hi, I just finished reading your transformation on the dresser with wall paper. I plan on taken your idea to do on a small buffet server but I just have one question for you. 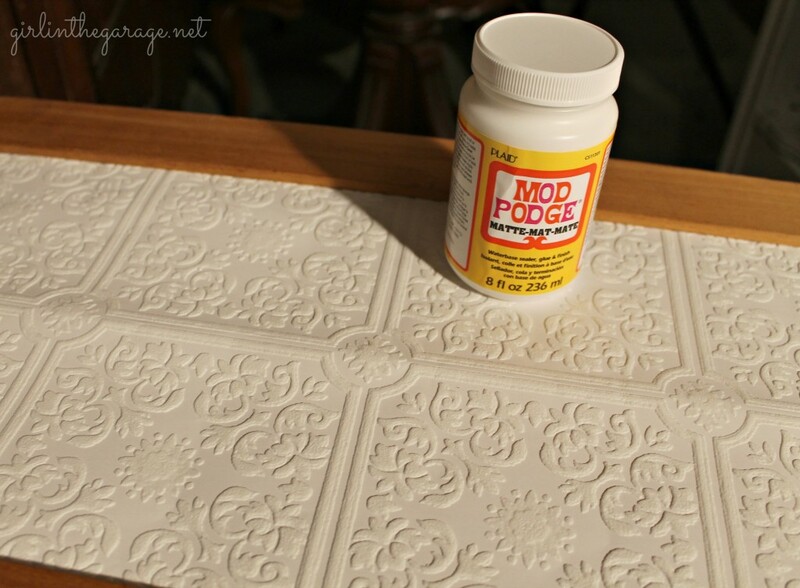 Which Mod Podge did you use (as they have different ones) and also how did you apply it? Did you apply it to the dresser then lay your paper down or did you apply it to both and then apply a coat over the top? I love how your dresser looks, it really is beautiful. I appreciate your help with the mod podge application. Thank you very much for your help. I used the Matte Mod Podge (I usually do, because I like that it dries clear). 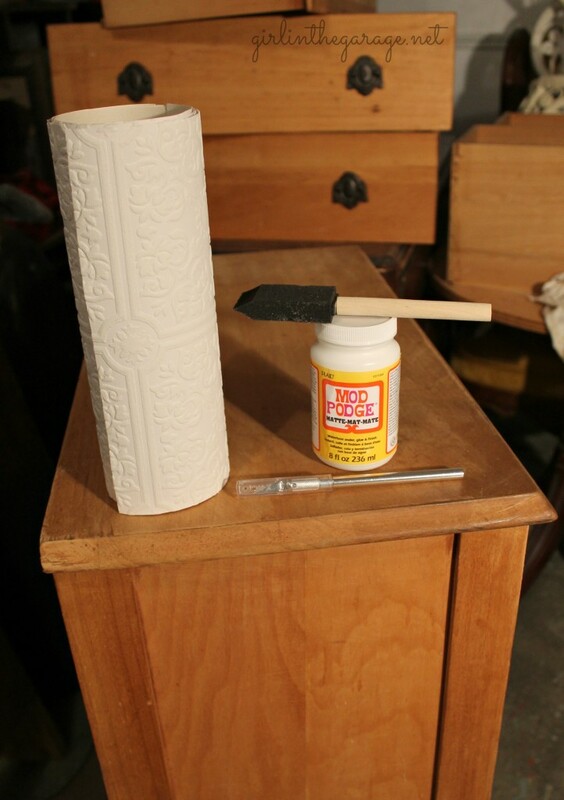 I find it easier to apply the Mod Podge to the furniture first and then carefully lay the paper over it, pressing it down onto the glue. I wouldn’t apply the Mod Podge to the paper/fabric first because it could get messy and curl up before you have a chance to lay it on your piece. Hope that helps – good luck!